This two-day workshop sponsored with funding from the U.S. Department of Education was designed to provide some time and resources for faculty from a variety of disciplines to get together to discuss ways in which they might develop two evening faculty panel events that integrate alcohol and other drug content with films, readings, and discussions from classes during the term. 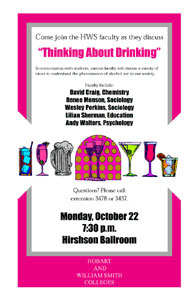 These events are intended to enhance curricular discussion of topics related to alcohol, tobacco, and illicit drugs. In addition to familiarizing each other with our various interdisciplinary interests in this topic and discussing how material is or might be integrated in our courses, a key objective of this workshop is to plan a film screening and fall evening panel program around some issue of alcohol, tobacco, and/or other drugs that can be linked to some of our courses. Chip Capraro (Hobart Assoc. Dean), David Craig (Chemistry), David Diana (director of Alcohol and Other Drug Programs), Jack Harris (Sociology), Steven Lee (Philosophy), Renee Monson (Sociology), Erin Pelkey Chemistry), Wes Perkins (Sociology), Lillian Sherman (Education), Michelle Rizzella (Psychology), Richard Salter (Religous Studies), Andy Walters (Psychology). Conveners share local print, video, and web resources on ATOD topics. Working lunch to determine the structure and timing of the fall film(s) and panel program. 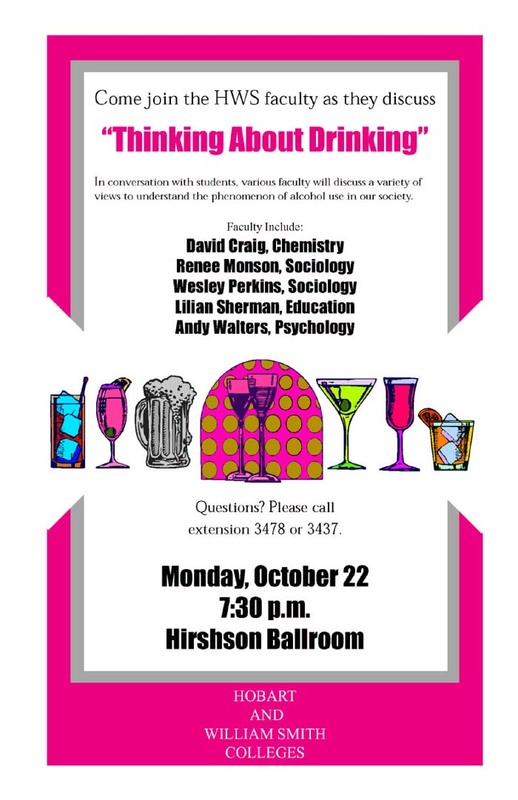 Evening Faculty Panel -- "Thinking about Drinking"
Evening Faculty Panel -- "Caught in Traffic: Criminalization/Decriminalization debate"
This workshop is provided through the generous support of the U.S. Dept. of Education, and Hobart & William Smith Colleges.